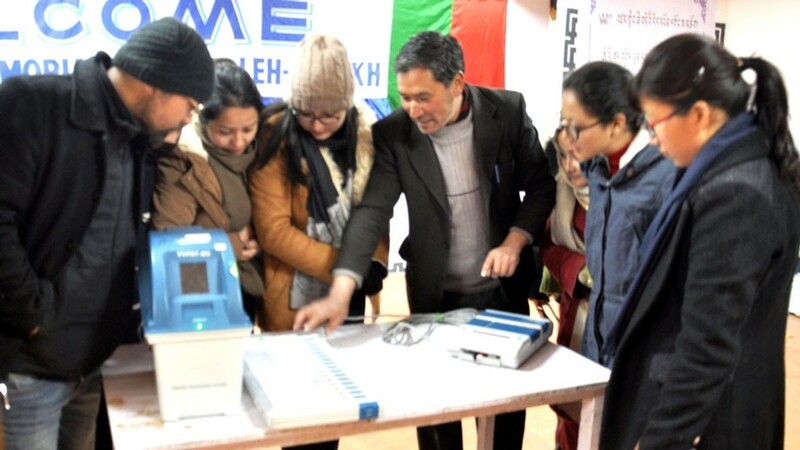 A training program on Electronic Voting Machine (EVM) and Voter Verified Paper Audit Trail (VVPAT) was held on February 28 for staffs and students of Eliezar Joldan Memorial College, Leh. The training was organised by District Election Authority, Leh to achieve Systematic Voter’s Education & Electoral Participation, (SVEEP). The training was conducted under the supervision of Assembly Level Master Trainer (ALMT) Mohd. Ayub and Mohd. Rohulla. Demonstration on the functioning of EVM and VVPAT among other important procedure of polling was imparted. The trainers have also motivated the new voters by educating the importance of voters’ participation in election phases, the young voters were encouraged to exercise their voting franchise for strengthening India’s democratic system.